Last night, I enjoyed a delicious meal at The Chase in downtown Toronto hosted by Chef Michael Smith and Cascade. The theme of the evening: how to plan for a dinner party that sparkles. Items on the menu were taken from Chef Michael Smith's newest cookbook and included his Sunny Southwest Salad, Greek Chicken and Flaming Bananas, which were to die for! 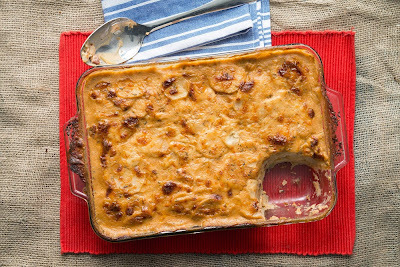 As an hors d'oeuvre, we enjoyed Bacon Potato Casserole, a perfect marriage between bacon and potatoes with cheddar cheese to hold it all together. It was so scrumptious that I am going to have to try making it myself. Luckily, as a P&G mom, I get to share this Cascade-exclusive recipe with you so you can try it, too! Preheat your oven to 350°F (180°C). Turn on your convection fan if you have one. Lightly oil a 13x9-inch (3.5 L) baking pan. Toss the bacon, along with a big splash of water into a large soup or stockpot over medium heat. Cook, stirring frequently until the water evaporates and the bacon is fully browned and evenly crispy, 10 minutes or so. Pour the works through a strainer. Reserve the crisp bacon and return 1/2 cup of the flavourful bacon fat to the pot. Discard the rest of the fat or save it for another use. Sprinkle the flour over the fat and stir the works into a paste. Return to medium heat and slowly pour in the milk, whisking the sauce as it heats and thickens. Briefly bring to a full furious boil, and then reduce the heat to a slow, steady simmer. 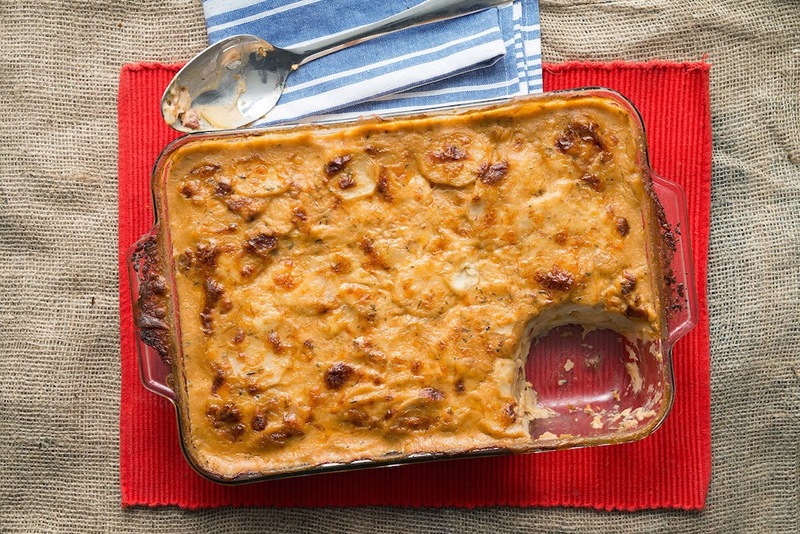 Whisk in 2 cups of the smoked cheddar cheese and the thyme, paprika, salt and hot sauce. Remove from the heat. Stir the potatoes and the crisp bacon into the sauce, coating them evenly. Transfer the works to the baking pan, nudging into an even layer. Sprinkle the remaining smoked cheddar cheese evenly over the surface. Loosely cover the works with foil that’s been coated with a light film of cooking spray. After 60 minutes remove the foil so the top can begin browning. After 90 minutes begin checking for doneness every 10 minutes or so. Bake until the potatoes are tender, the top is golden brown and the sauce is bubbly, reduced and thickened, up to 2 hours in total. Serve and share! Now, if you're worried about the clean-up, fear not. Simply place the empty casserole dish in the dishwasher with Cascade Platinum. You don't even need to pre-wash! 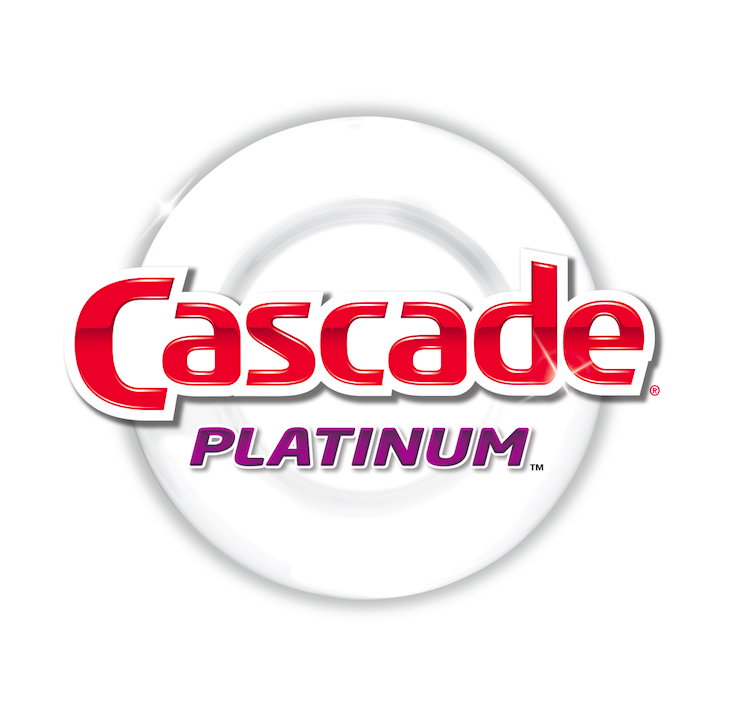 One of the things I learned during Cascade Blogger Day last summer was that Cascade Platinum cleans stuck-on food in one wash. The special formula is combined with the grease-fighting power of Dawn to help ensure your next dinner party sparkles. For more dinner party tips and recipes visit foodnetwork.ca/cascade. You will also find useful videos on how to create a welcoming table setting and how to create a party grand finale. I'm going to have to make this for my family. It's looks so good and sounds very easy to make. YUM! 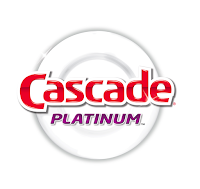 I like to use Cascade dishwashing detergent. I've seen Chef Michael Smith speak before and enjoyed his practical approach to family cooking. The recipe looks divine and probably makes for great leftovers too. Oh my. This recipe is a must try. It has all the right things! This looks very tasty going to pin it for next weekend for hubby's birthday! Thanks for sharing, I love trying new recipe's! can't pin it they say image to small,weird!! Your one lucky lady to be spending time with Chef Michael Smith, and that dish looks awesome, would make an awesome side!! I could totally devour this right now....no breakfast calls for an early lunch! That sounds amazingly delicious. Yum!! !